Come and learn the skills required to learn how to stand up paddleboard in Dorset and take to the blue stuff with us on one of the best ways to travel. Let one of our experienced instructors teach you the skills required to use our nah skwell stand up paddle boards in Studland Bay, a beautiful and perfectly sheltered beach ideal for stand up paddleboarding. This is the fastest growing watersport going and is the perfect fun adventure activity for all ages. 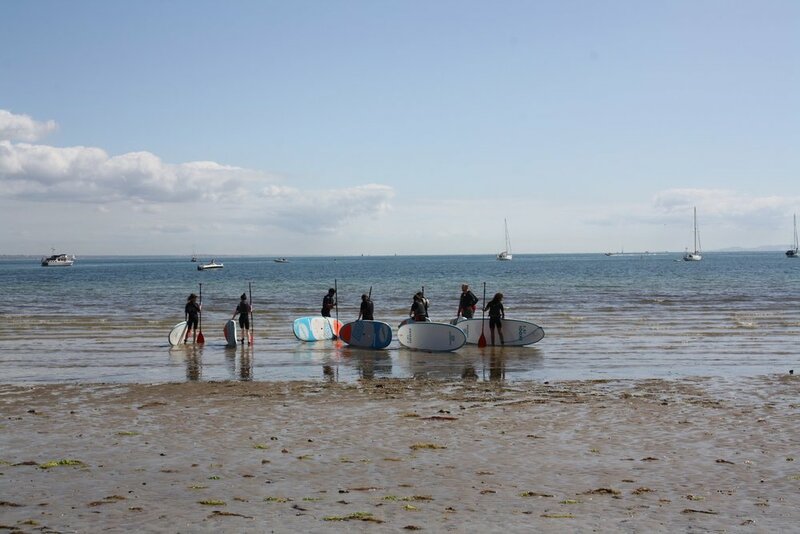 We offer stand up paddleboarding experiences in Studland, Dorset. Learn to Stand Up Paddleboard with us on the Jurrasic Coast in Dorset, stand up paddleboarding is not only fun but a brilliant core work out! Our experienced instructors can give you the stand up paddleboarding tuition you need to help you quickly master the skills within a two hour taster session so that you are confident and able enough to start using your new mode of transport right away!! Our beautiful location in Studland, a stunning secluded sandy peninsula in Dorset is just a short drive away from Bournemouth, Poole and Swanage. From here we tour on the stand up paddleboards from our base on Middle beach to explore the sunny bay with Old Harry Rocks as our backdrop. Safety is our number one priority and we can guarantee that all our instructors are trained to industry standard best practice and hold National Governing body qualifications where applicable, to operate in line with our AALA licence for coasteering and kayaking. As a WISE wildlife safe accredited operator you be can rest assured that we work responsibly, without disturbing the wildlife and sealife and we forage sustainably and sensitively. We have heaps of adventures on offer in Dorset. Kayaking, foraging, fishing, bushcraft and more...take a look and make a full day of it. This summer we will be running family adventure days where you can join us for a day of adventuring, these will run throughout the summer and will include 2 x 1 hour workshops and 2 x 1 hours kayaking and stand up paddle boarding hire. under 16s £35pp adults £50pp. Read what our customers love about our stand up paddleboarding adventures in Dorset ! !